A new line of readers and credentials from HID Global makes technology-independent digital keys and portable identity credentials a reality for access control markets. The iCLASS Secure Identity Object-Enabled platform (iCLASS SE) enables credentials to be deployed on smart phones, contactless smart cards, contact chip cards, USB tokens and other devices. This is an evolution in security technology, says Brad Jarvis, vice president of product marketing at HID Global. Twenty-years ago proximity technology was the de facto standard for physical access and then the last decade saw the rise of contactless smart cards. The SE platform is based on open standards to support an array of smart card technologies, including iCLASS, MIFARE, DESFire, EV1, Indala and others. Secure Identity Objects operate within HID’s Trusted Identity Platform (TIP) framework, which creates a secure and trusted boundary for cryptographic key delivery in access-control applications. The TIP framework ensures that portable credentials can be securely provisioned on credential platforms, including mobile devices, no matter where users are located or how they are connected. Secure Identity Objects also ensure data authenticity and privacy. Data cloning is prevented by binding information to a specific credential for additional authentication and encryption on top of device-specific security. Such features enable the iCLASS SE platform to improve security in traditional card and reader applications while enabling new market opportunities for carrying secure portable credentials on smart phones and other devices. The new line also has some sustainability features that promote “green” efforts, Jarvis says. The readers have a power management features that limits energy consumption during non-peak usage times. “This can save up to 75% of energy consumption over standard readers,” he says, adding that the device can help contribute to LEED certification. Feature multi-layered security with a tamper-proof design using EAL5+-certified secure element hardware to protect keys and cryptographic operations for additional data security. The field-programmable readers also feature energy-efficient intelligent power management and use recycled content to help build LEED credits. Available in two configurations: iCLASS SE Readers and multiCLASS SE Readers that enable seamless migration by supporting multiple credential technologies including 125 kHz HID Prox, Indala, AWID and EM4102. iCLASS SE Cards: available in 2k-bit, 16k-bit or 32k-bit versions. Users can add a magnetic stripe/bar code and anti-counterfeiting features including custom artwork and photo IDs. 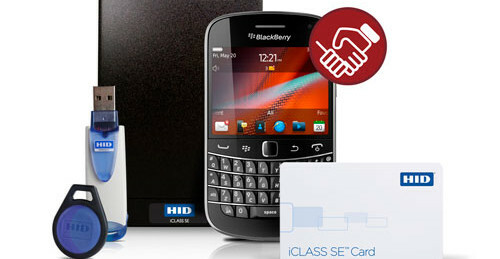 iCLASS SE Clamshell Cards: feature an ABS shell construction for durability in harsh environments. MIFARE SE Cards: use mutual authentication and data encryption with a 32-bit serial number, and feature securely separated sectors to allow complex applications and future expansion. MIFARE DESFire SE Cards: available in PVC and Composite PET/PVC construction, they can accept an embedded contact chips for logical access and biometric ID systems.